At the rate we’re going, Christmas in July will soon be a real thing. The weekend before Thanksgiving this year — before the first turkey had been stuffed — a local Christmas tree firm got hundreds, yes, hundreds, of calls looking for trees, something the company did not even have in stock yet, considering that it was still mid-November. Wayfair, the Boston-based Internet retailer, saw interest in holiday decor spike in August this year, a month earlier than in 2016. “Wayfair customers viewed Christmas SKUs more than 100,000 times in just one week,” according to publicist Julie Cassetina. At Winston Flowers, customers this year are skipping fall plants and going straight to holiday pine cones, conifers, and birch for holiday displays, said Matt McKenna, creative director of garden design. After years of griping that retailers are rushing all the holidays — pushing Halloween into the humidity of August and stocking the Christmas goods not long after — civilians, it seems, have decided to join them. “I just feel we don’t have enough time in the season to celebrate,” said Annmarie Seldon. Well, some people don’t, anyway. The Bedford lifestyle blogger and public relations consultant solved the problem by putting up her decorations the day after Halloween this year, weeks earlier than usual. Her teenagers were so annoyed by what they considered premature decorating that they refused to help (at least that was their stated reason). But now, with almost a full month of holiday decor to relish before Dec. 25 arrives, she’s living in a wonderland. “I can enjoy a cup of tea by the Christmas tree,” she said. 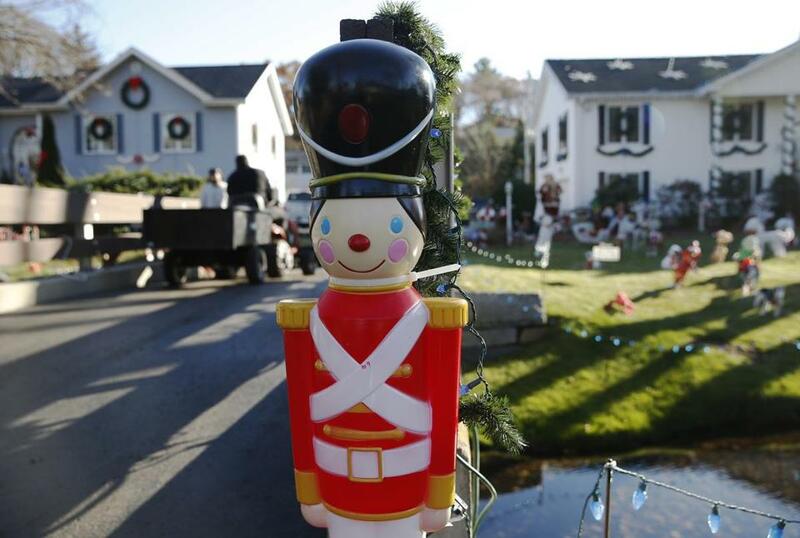 Mike Conlon's house in Saugus is beginning to show he holiday spirit. Conlon who has been going all out for the past 30 years says it'll be another week or so until his house is fully decorated. Here we are, not even in December, and reports are coming in of Santas on roofs all over town, of giant candy canes flashing, elves involved in all sorts of elfin silliness. Tasteful single candles are glowing from windows, giant trees are displayed in living rooms, glittery rebukes to those who still have rotting pumpkins on the front stoop. What drives a person to face hundreds of feet of tangled strings of lights — and boxes of ornaments and the roof — way before deadline? For some, it’s a desire to enjoy as much Christmas as possible. Others are trying to beat the cold, or check something off their to-do list, even if it’s something nice, like Christmas. Some — like Michael Conlon of Saugus, the creator of a famed and beloved holiday display that takes hundreds of hours to erect — have such a big task that if they don’t start early they’d never finish. Many don’t know why they’re doing it so early, other than they’re answering some internal call that’s been drilled into our souls by national retailers. 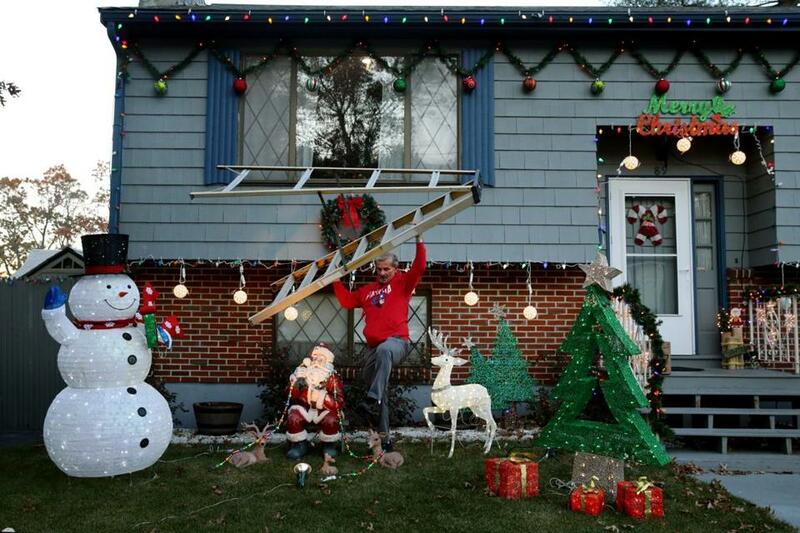 Mike Kwiatek put the finishing touches on his holiday decorations at his home in Lynn on Tuesday. Indeed, we’ve come to live in such a retailer-dominated world that the merchandise cramming the shelves of big box stores tells us as much about the time of year as the actual calendar or the weather. 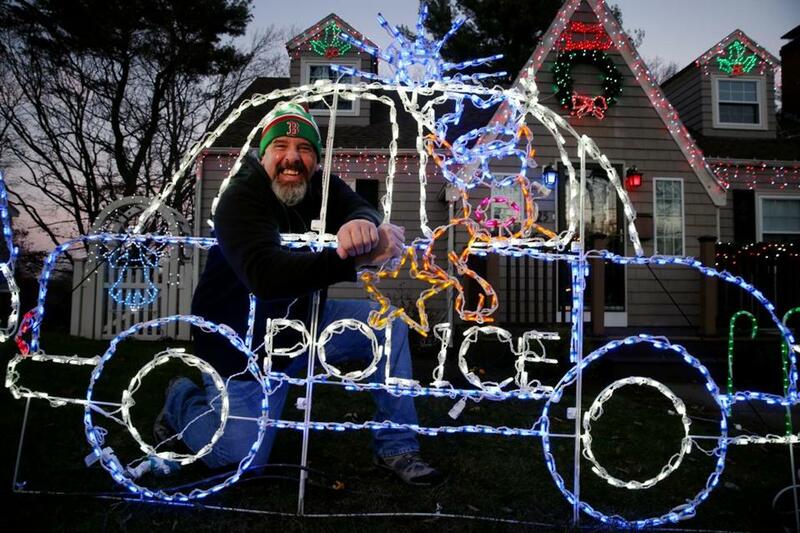 In Lynn, Shawn Hogan — a police detective who grew up in a family of early decorators — likes to get his wares up before Thanksgiving, but he faces pushback within his own home. He worked several six-hour shifts putting up icicles and wreaths and enormous candy canes and animals and a new elf-and-Santa set — and then waited for permission to flip the switch that would illuminate his work. “The lights can’t go on until after Thanksgiving; that’s my wife’s and daughter’s rule,” he said. In Wellesley, Craig Mack, the dean of students at a local college, felt such pressure to get his display up early that he took Monday off from work so he could put up his antique sleigh and enormous ornamental Christmas balls and wreaths. He likened the feeling to work stress. “There’s an amount of perfectionism,” he said. Meanwhile, even as early decorators take heat for upping expectations for everyone else, they, too, have their gripes. Mark Grady, a Leominster man who gets his holiday display up in October, doesn’t like it when people leave decor up too long. Beth Teitell can be reached at beth.teitell@globe.com. Follow her on Twitter @bethteitell.